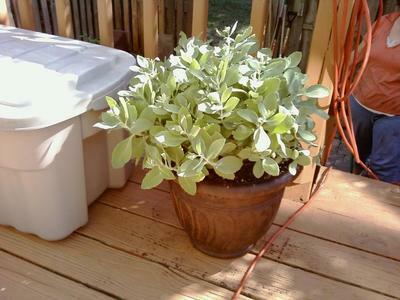 I found this plant in a broken plastic container in the backyard of the townhouse I bought a couple years before I took this picture. I admit I don't know much about plants, but I'm learning. This plant flourishes every year with no help from me, but I was nice to it anyway and put it in a nice pot so it could show off for visitors. It sprouts with clusters of pale pink flowers, and the plant dies off and comes back every year. It has even spread to other pots, so I'll take those seedlings and re-pot them for friends and family. I don't know what to call it, though, other than wonderful. Any ideas? Hi Elaine, this looks like and sounds like from your description of being totally herbaceous (dying back to the ground in the winter) that it's one of the Sedum spectabile group. Without seeing the blooms I can't be 100% sure, but it looks very similar to Sedum 'Brilliant' or 'Neon'. You can see more about the Sedum for borders here. Best of luck with your great plant!